One year ago I prided myself on being thrifty, not someone who needed to keep up with the most forward trends or fill my closet with the most expensive fashion pieces. I would gush about my latest super-cheap find at nearby department stores, and this was all while knowing--and caring--nothing about my clothing beyond what it looked like. Where do they find this cheap labor? They use vulnerable children and adults typically in situations of poverty. The apparel industry as a whole is a huge vehicle for human trafficking, and every step of the supply chain for most of the cotton that is produced is plagued by child labor and modern day slavery. First, the planting and cultivating stage is laborious for adults, and even more so for children. According to LexisNexis’ resource on the cotton industry’s relationship with forced labor, the cotton plant requires long hours of cleaning, weeding, seeding, hauling water to fields, AND individually cross-pollinating each flower by hand for production. Reports have shown that, in addition to long working hours and low or zero pay, children are also exposed to dangerous pesticides that have long-lasting repercussions for their health. Cotton is harvested largely by children because their small fingers are less abrasive to the plant. They gather enormous amounts of cotton for our clothing and fabrics and yet are kept from receiving basic schooling and other resources. Further, many workers who do not live near the fields are forced to move closer during the harvest season and stay in cramped, unsanitary conditions. 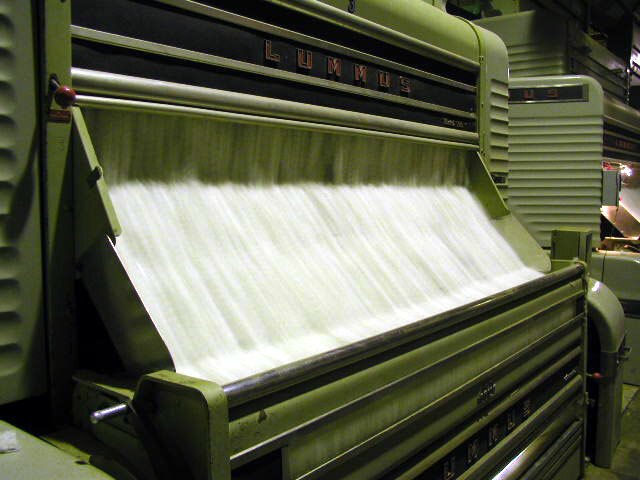 Workers run the cotton gins, in which the harvested cotton is dried and cleaned to separate the seeds from the fiber. This material also must be dyed or bleached before being spun into thread and woven into fabric. Finally, it can be made into a final product that does not reflect the months of arduous and exploited labor that was necessary for its production. Children are present in every step of production, and they often find themselves there under the false impression that at the spinning mills they will find “a well-paid job, comfortable accommodation, three nutritious meals a day and opportunities for training and schooling, as well as a lump sum payment at the end of three years,” according to a report by the Center for Research on Multinational Corporations. Children are often seen as optimal employees because they are easy to control and direct and go largely unnoticed and voiceless. It’s alarming to realize that poor children and adults are NOT the first marginalized and oppressed groups of people to be forcibly employed for cotton production. The doomed trait of choice has moved from skin color to age and economic standing. Slavery has not been eradicated, readers; it simply has a different face. This form of modern day slavery often stems from inequalities that create vulnerable and willing victims. Impoverished people are desperate for work, even with low pay, and more liable to believe false promises that actually lead to jobs in dangerous or poor working conditions. This, unfortunately, decreases the likelihood of individuals receiving education and increases the likelihood of those poor children growing up to be poor adults. Players in the textile industries get away with their exploitation because supply chains are so incredibly complex and involved. Even if companies try to have ethical practices, they often have no idea where their products are originally made before being passed and sold between factories and organizations. Thankfully, more businesses are trying to implement structures that increase supply chain transparency. This is due, in part, to consumers taking responsibility for their purchases and being bold enough to hold stores accountable for what they sell. It’s better to ask companies to address the issues of trafficking and forced labor within their supply chains rather than asking them to ban the culprits. Instead of running away from the companies at fault, pressuring them to change their practices can hopefully lead to the people at the very bottom tier being paid better and working in altogether better conditions. It’s better to ask companies to address the issues of trafficking and forced labor within their supply chains rather than asking them to ban the culprits. Organic production is better for workers due to the lack of toxic chemicals, but it does not equal fair trade. However, organic and fair trade products sometimes overlap, and organic farmers realize that their businesses have an impact on the environment and people. Products made with organic cotton might be initially more expensive, but continuing support of water-saving, health-conscious, high-safety business will have long-term advantages for the world. Be challenged to care about your clothing for more than its trendiness. Thrift shop a bit more, or research ethical companies that share the value of justice; invest in pieces that are built to last and that won’t be thrown out with the swaying fashion seasons. Every article of clothing contains the stories of the hands that made it. Consider how your purchasing power as a consumer can help change those stories. Chynna Terrell is an ENFJ who just graduated with a degree in English Literature from the University of Oklahoma (boomer!). Ast her time in school, she served as president of her InterVarsityFellowship chapter and loves to write and edit for the Dressember blog. And, why yes, she would love to have you over for a hot cup of tea, a puzzle, and good conversation.